10 Tips That Will Improve Your Crossy Road High Score! Lots of ways that you can get a new high score on the addictive game. Crossy Road is a very addictive game, I sometimes lose most my work lunch break from it! When the score starts to build it can begin to feel a bit frantic. Here I have put together different ways that should help you get a new high score, I expect at least one or two will be able to help you, if none of them do then you must be a very good player and in that case I don’t know why you’d be here! 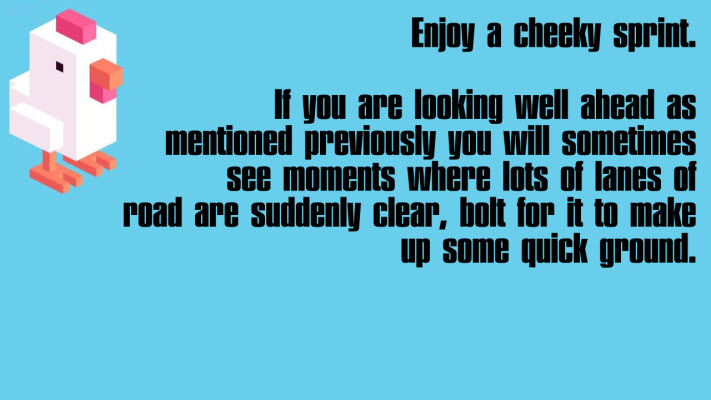 There are no cheats or hacks here, just good advice, so let’s crack on with the different ways which are in no particular order. Each main tip is in image form so you can share them, save them or whatever you want, along with a bit of text commentary too. Tip 1 is the one which helped me the most. Use the pause button in the top right of the screen. Wait until you are in a safe place, best not to do it in the middle of crossing, click the pause button and catch a breath and let your fingers rest. 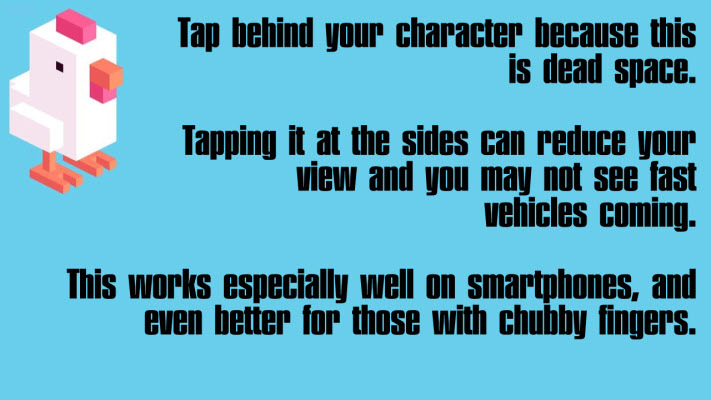 Tip 2 is to tap right behind your character, not at the side of your screen. If you aren’t used to this it may take a bit of getting used to, but give it a try. 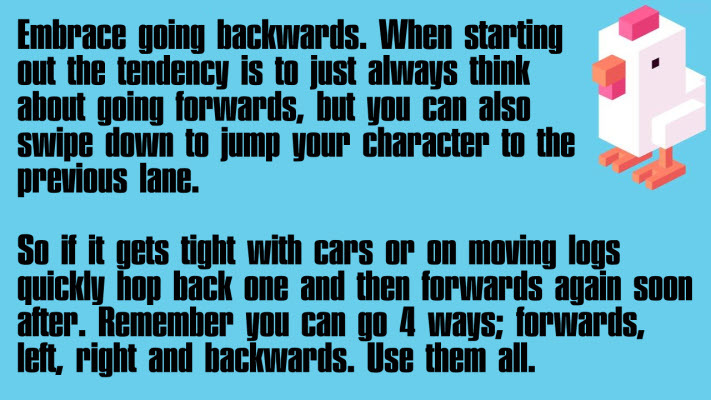 Tip 3 is getting good at going backwards. You can’t always just hop forwards as you will run out of gaps in traffic or river logs. All the good players that get the big scores are very fluid in their movements and able to go back a step or two in order to avoid danger so they can then proceed forwards. 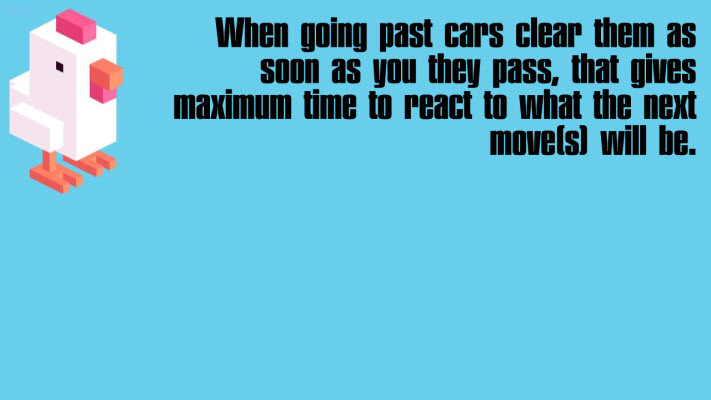 Tip 4 is to get past cars quickly to give you the most time to react to your next upcoming moves, but don’t be too hasty that you jump in to the vehicle! 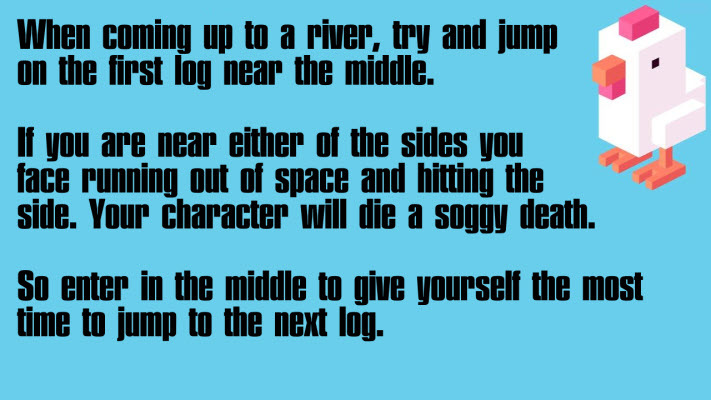 Tip 5 is to enter rivers near the middle, this gives you the maximum width to work with and buys a bit of extra time. 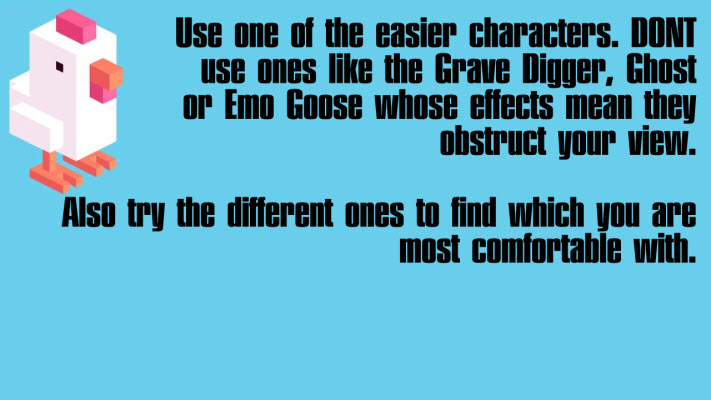 Tip 6 is to play with one of the easier characters. Stay away from ones like Grave Digger or Ghost because the lighting effects mean you see less and a speedy car can quickly wipe you out. Choose a character with not too many effects and who moves quickly, I have always like the basketball player but try out a few to pick your fave. 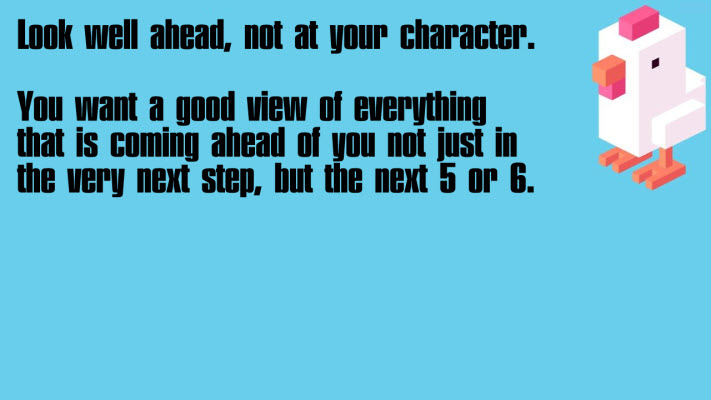 Tip 7 is to get in the habit of looking well ahead, not at the actual character. You need to know what is ahead not only in the next step, but the next few. This may sound obvious but be double sure you are doing it. Tip 8 is to sprint for it when possible. For a start, this feels like good fun when you quickly burst thru a load of steps. But don’t overdo it and go ploughing into a train or anything. It will help quickly up your score and is a good way to make ground up so you have a bit more time should you then come up to a trickier section which requires more patience. 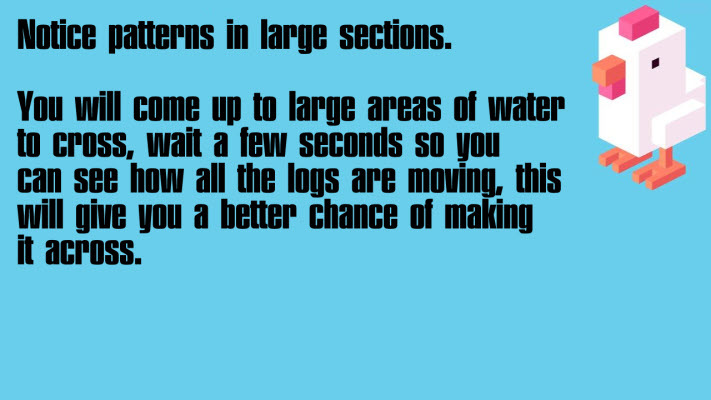 Tip 9 is to quickly look out for patterns in large areas such as multiple log crossing. This will give you a better chance of getting across and not getting caught out and ending up reaching the sides and getting washed away bringing your score to an abrupt end. Tip 10 is to ignore the coins. Once you have got a few good characters to use it doesn’t matter, you will get given free ones anyway. In chasing coins you waste time and run the risk of making a mistake. 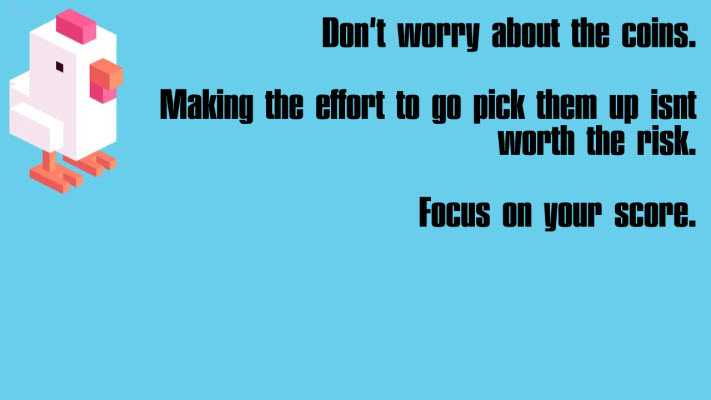 Ignore them, focus on the score that is all. And that is your lot. Put those into action and see how you do. If you forget them come back to remind yourself of them and have another crack. Persistence is important, keep going with your new arsenal of skills and eventually, the big scores will mount up! No matter how many works breaks it takes, you will get there. Be careful if you’re self-employed though, it could end up reducing your income. If you get a new high score you are welcome to tweet us @moneycortex, if this page does prove helpful please share it on your social networks as a tiny reward for me, that would be awesome. Do you know more useful ways to improve scores which aren’t listed here? You can send them in and contribute to this page. Happy gaming.